The Seven Holy Youths of Ephesus: Maximilian, Iamblichus, Martinian, John, Dionysius, Eksacustodianus (Constantine) and Antoninus, lived in the Third Century. Saint Maximilian was the son of the city administrator of Ephesus, and the other six youths were sons of other illustrious Ephesus citizens. The youths were friends from childhood, and all were together in military service. When the emperor Decius (249-251) arrived in Ephesus, he commanded all the citizenry to appear for offering sacrifice to the pagan gods; torture and death by execution awaited the recalcitrant. By denunciation from those currying the emperor’s favour, the seven youths of Ephesus were summoned to reply to the charges. Standing before the emperor, the seven youths confessed their faith in Christ. Their illustrious military decorations – the military sashes – were quickly taken from them. Decius however set them at liberty, hoping, that they would change their minds while he was away on military campaign. The youths fled from the city and hid in a cave on Mount Okhlonos, where they passed the time at prayer, preparing for the deed of martyrdom. The very youngest of them, Saint Iamblichus, having clothed himself in beggar’s attire, went into the city and bought bread. In one of these journeys into the city he heard, that the emperor had returned and sought them, so as to bring them to trial. Saint Maximilian exhorted his companions to come out of the cave and bravely appear at trial. Having learned where the lads were hidden, the emperor gave orders to seal the entrance of the cave with stones, so that the lads would perish in it from hunger and thirst. Two of the dignitaries, coming before the walled-up entrance to the cave, were secret Christians. Wanting to preserve the memory of the saints, they set in among the stones a sealed container, in which were located two tin sheaves. On them were inscribed the names of the seven youths and the details of their suffering and death. But the Lord brought upon the youths a miraculous sleep, continuing almost two centuries. During this while the persecutions against Christians had ceased, although during the reign of the holy nobleborn emperor Theodosius the Younger (408-450) there had appeared heretics who rejected the belief in the Resurrection of the Dead at the Second Coming of our Lord Jesus Christ. Some of them said: “How can there be a resurrection of the dead, when there would be neither soul, nor body, since they are disintegrated?” Others affirmed: “Only the souls alone would have a restoration, since it would be impossible for bodies to arise and live after a thousand years, when even the dust from them would not remain.” The Lord therefore revealed the mystery of the awaited Resurrection of the Dead and of the Future Life also through His seven youths. The master of that region of land, on which Mount Okhlonos was situated, discovered the stone construction, and his workers opened up the entrance to the cave. The Lord had kept alive the youths, and they as it were awoke from their habitual sleep, not suspecting, that almost 200 years had elapsed. Their bodies and clothing were completely undecayed. Preparing to accept torture, the youths entrusted to Saint Iamblichus yet once again to buy bread for them in the city to keep up their strength. Going towards the city, the youth was astonished, seeing the holy cross on the gates. And hearing the freely uttered Name of Jesus Christ, he began to doubt that he was approaching his own city. Praying for the bread, the youth gave the merchant money with the image of the emperor Decius on it, and he was detained, as one possibly concealing an horde of old money. They took Saint Iamblichus to the city administrator, who at this time happened to be the bishop of Ephesus. Hearing the bewildering answers of the youth, the bishop perceived, that God was revealing through him some sort of mystery, and set out himself with other people to the cave. At the entrance to the cave the bishop took out the sealed container and opened it. He read upon the tin sheaves the names of the seven youths and the details of the sealing-up of the cave on the orders of the emperor Decius. Going into the cave and seeing the youths alive, everyone rejoiced and perceived that the Lord, through their awakening from long sleep, was disclosing to the Church the mystery of the Resurrection of the Dead. Soon the emperor himself arrived in Ephesus and conversed with the youths in the cave. Then the holy youths in view of everyone lay down their heads upon the ground and again fell asleep, this time until the General Resurrection. 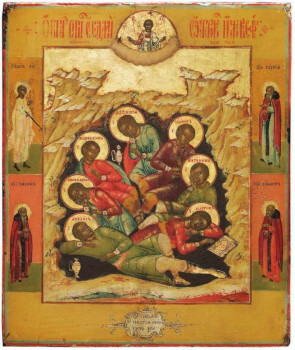 The emperor wanted to place each of the youths into a jeweled coffin, but appearing to him in a dream, the holy youths said, that their bodies were to be left in the cave upon the ground. In the Twelfth Century the Russian pilgrim the hegumen Daniel saw in the cave these holy remains of the seven youths.